I started walking into my editor’s office one morning about 35 years ago, but stopped after two or three steps past the door. This man was usually red-faced and loud; he usually would greet me with an obscenity and a coarse reference to my ethnicity — just to let me know he still loved me. On this morning, I could see that there would be none of that, because he sat behind his desk, ashen-faced, with a New York City newspaper spread out in front of him and, when he was aware of my intrusion, only muttered something that I could not hear. Eventually, I learned that he had just read a story about a group of students at a New York college who had reacted to some beef they had with the school administration by burning copies of the campus newspaper. While I didn’t need my editor to explain to me the principle that was at issue, seeing this brash man nearly made physically ill by the very idea of Americans burning a publication brought the weight of it down on me as nothing has before or since. A great deal has been written and said about the plan to burn copies of the Qur’an at the Dove World Outreach Center in Gainesville, Fla. It is born of the ignorant idea that there is something inherently incompatible about being a Muslim and being an American — and idea John Adams debunked in the 18th century. John Adams — one of the “founding fathers” we hear so much about these days. 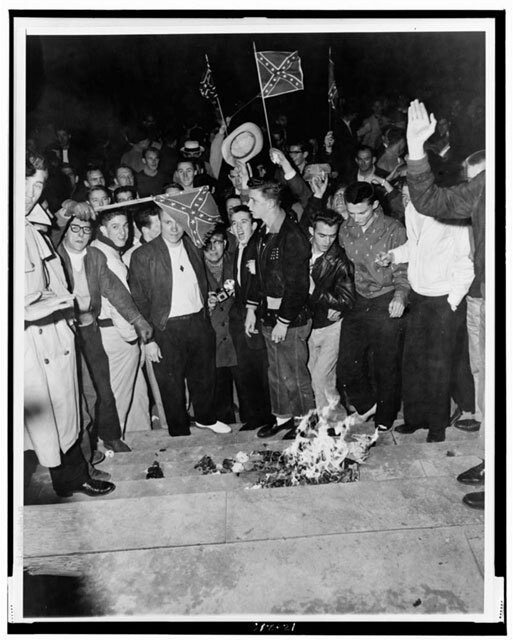 University of Alabama students burn desegregation literature in 1956. There is nothing inherently incompatible about being a Muslim and being an American, but there is something inherently incompatible about calling ones self an American and burning books. And I wouldn’t be too quick — as some have been — to dismiss the Gainesville congregation as a fringe group. American “values” are being evoked these days by a lot of people who are not associated with that church but whose idea of American values is no less distorted. 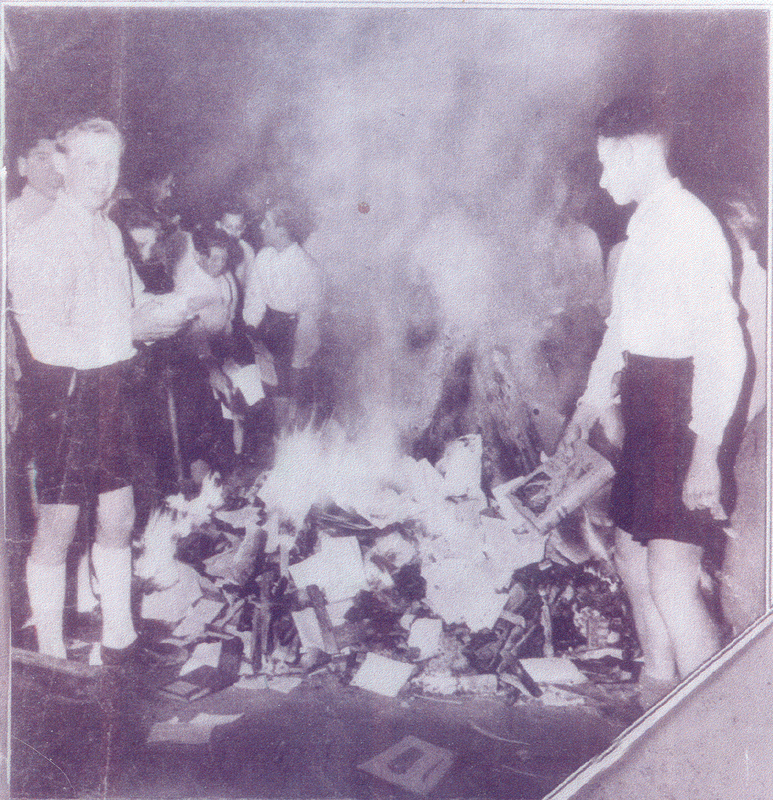 For every one willing to burn a book, there are plenty who would stifle any viewpoint other than their own. Anyone who hasn’t heard that in the rhetoric of the past two years hasn’t been listening hard enough. Meanwhile, what comes after burning the Qur’an? Detention camps? It seems the impulse to “purge and cleanse” is more deeply rooted than I like to think. 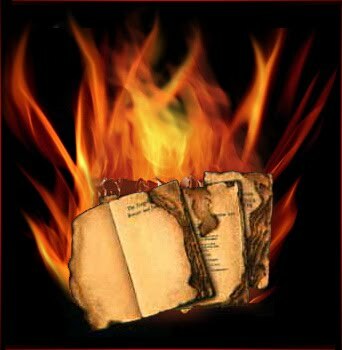 There was a good bit of talk last Halloween when the Amazing Grace Baptist Church of Canton, North Carolina decided to put the torch to such spawn of Satan as the New Revised and Revised Standard versions of Holy Scripture. I can’t quite put my finger on it, but it feels like there’s not a lick of difference between the groups – except for the object of their hatred, of course. It seems ironic that many of the same folks who express horror at the stoning of Islamic women see no connection between those events and their own behavior. Beyond that, I’d be much happier if General Petraeus were to be more clear that book-burning shouldn’t take place because book-burning is wrong. Harm to our troops may be a consequence, but I’m not sure that should be the first argument against picking up the torches. I agree that Petraeus should have given his remarks a broader context. In fact, that’s what prompted me to write this post. The Dove World Outreach Center. Sounds as though they were on the right track when they came up with the name. Then what happened? The Asbury Park Press published an editorial a few weeks ago chiding Glenn Beck’s “Restoring Honor” spectacle as (to paraphrase) the angry rants of some doughy white men. Many people canceled their subscriptions in protest. What they really were doing is cutting off any exposure to points of view that didn’t explicitly match theirs. We as a people seem to have lost the ability, let alone the willingness, to debate with respect for those we disagree with, to consider any other point of view, to grow through exposure to other beliefs and information. To embrace life as a challenge. Well said. I wonder how widespread this closed-mind attitude is. Some of our friends and acquaintances and relatives are infected by it, but it seems to me — with no science to back me up — that at least as many people are disgusted with it. I watched about an hour and a half of the C-SPAN coverage of Glenn Beck’s rally. Except for the idea that we should respect people who serve in the military, the only palpable message I could discern was that we all should be Christians — which has to mean that we shouldn’t be Buddhists, Jews, pagans, or — shudder! — Muslims. I wonder about the propriety of using public property — and incurring public expenses — to promote that second message. Meanwhile, the political leaders in this country should be ashamed of themselves for what they contribute to the polarization of thought. Who would have thought 40 years ago that, in retrospect, Richard Nixon would look like a paragon of moderation?